They’re creepy and they’re kooky, mysterious and spooky, they’re altogether ooky, and they’re coming back to the big screen. You can catch up with The Addams Family this Halloween season in their new animated film—and if you can’t wait that long to get your spook on, take a peek at the new poster! 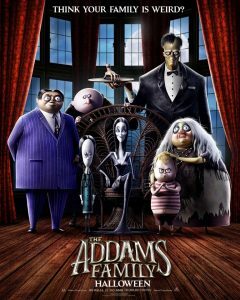 Directed by Conrad Vernon and Greg Tiernan, The Addams Family follows the titular clan as they prepare for their relatives to arrive for a big celebration. But an untrustworthy reality TV host (voiced by Allison Janney) could cause their lives to unravel. The voice cast is appropriately strange and deranged: Charlize Theron (Monster) as Morticia, Oscar Isaac (Ex Machina) as Gomez, Chloë Grace Moretz (Let Me In, Carrie) as Wednesday, Finn Wolfhard (IT, Stranger Things) as Pugsley, Nick Kroll (Big Mouth) as Uncle Fester, and Bette Midler (Hocus Pocus) as Grandmama. Elsie Fisher (Castle Rock) will voice Parker Needler, the daughter of Janey’s TV host Margaux. The script was written by Pamela Pettler (Corpse Bride) and Matt Lieberman. The Addams Family is expected to hit theatres on October 18, 2019, just in time for Halloween.